One of the things we have been doing as we travel from one state to another is reading from a National Geographic book entitled "Our Fifty States." Each entry includes a map, a short history of the state, state demographics and some interesting facts. We couldn't help but recognize the recurring theme in the history of Indiana, Kansas, Oklahoma, Iowa, Nebraska, South Dakota....that the white man eventually overcame the Native Americans destroying their way of life. It's a fact that those of us born and raised in the east can easily overlook...or be more or less ignorant about. Pilgrims and colonists seem to be our forte. In 1891, Red Cloud, Lakota, said of the white man, "They made us many promises, more than I can remember--They never kept but one; they promised to take our land, and they took it!" It's something that is very thought-provoking and in many ways makes me uncomfortable. However, it's one of the reasons I was so anxious to travel. I need my horizons broadened. :) It's also very humbling, "There but by the grace of God go I." People have and continue to suffer so much...and we have no idea. 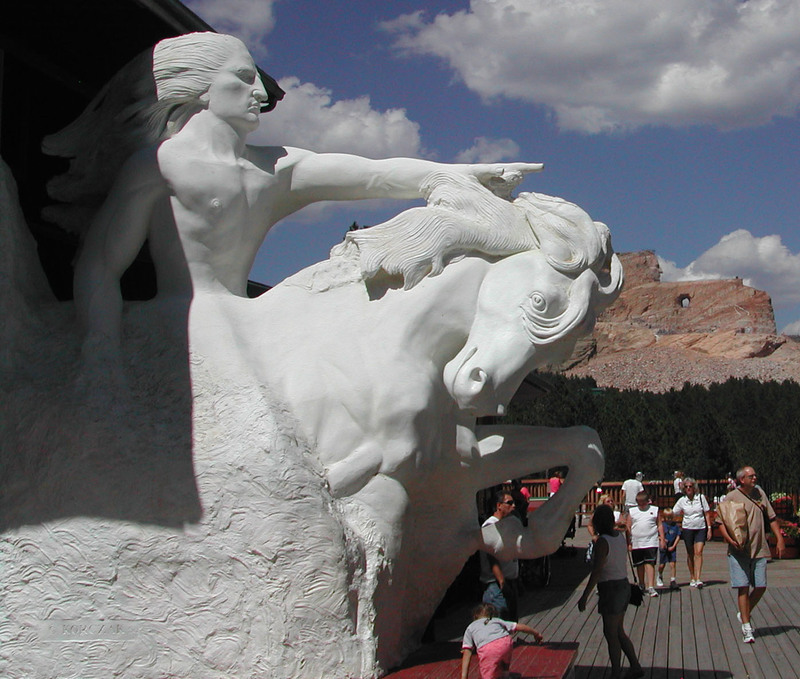 The Crazy Horse Memorial honors the Native American Indian. It is a mountain carving in progress a short distance from Mount Rushmore, but we found out it is so much more. It also includes an Indian Museum and Cultural Center, and there is a vision for so much more. I was surprised to see in one of the galleries, the 23rd Psalm Indian Version. Here is a link if you are interested in reading it. Native American Version of 23rd Psalm I'm not really that familiar with the culture of the Native American except that they believe in a supreme being and worship him through nature, but I've never seen any where that they acknowledge Jesus as the Son of God. 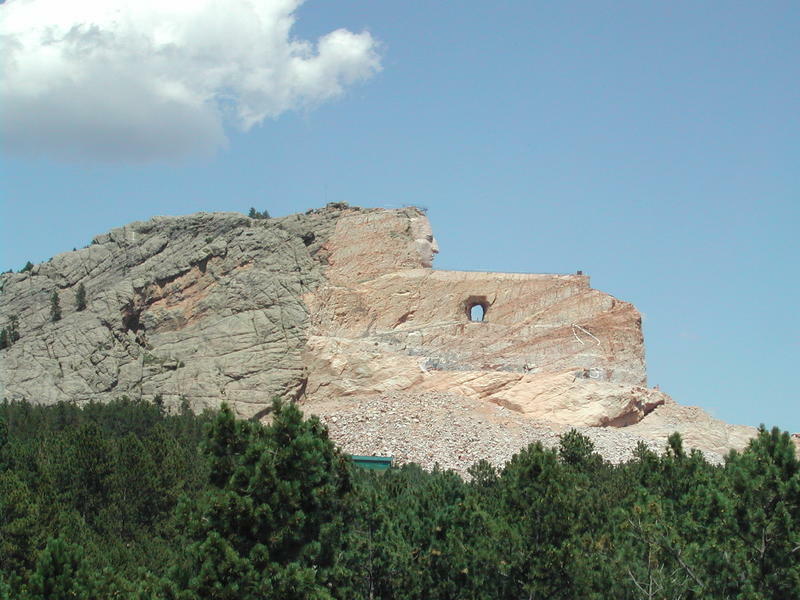 Sculptor Korczak Ziolkowski was invited by Lakota Chief Henry Standing Bear to carve Crazy Horse because he and his fellow chiefs "would like the white man to know the red man has great heroes, too." Koczak never took a formal lesson in art, sculpture, architecture or engineering. (Another source of wonderment.) He began this project in 1947 at age 40 as a bachelor but married and had 10 children with his wife, Rose. Korczak died in 1982 but his work is carried on by his wife with 7 of their 10 children who have chosen to stay and carry on to fulfill their father's commitment and legacy. The video we saw at the information center, "Dynamite and Dreams," included an endearing interview with Rose who shares the Crazy Horse story. It was interesting to learn that Korczak was a strong believer in the free enterprise system and felt Crazy Horse should be built by the interested public and not the taxpayer. Therefore, it is not a federal or state project. The project is being built through monetary gifts as well as gifts in kind, i.e., a bull dozer, excavator, air compressor, etc. The video also had excerpts of interviews with Korczak telling about the early days of the work... the first winter he lived in a tent as he built a studio-home and a 741-step staircase to the top of the mountain. He carried all the lumber for those steps up the mountain on his back. the choice that individuals and organizations have to pursue their dreams and live courageous lives. Most organizations are mediocre. Most people and organizations have visions that are too small for their capabilities. Most jobs are too small for the people in them." When the dreams end, there is no more greatness. Here is a picture of the 1/34th scale model seen 1 mile from the mountain. Currently, work is being done on carving via dynamite the 22-story high horses head. It is such a privilege to be able to travel, to be challenged by so many new experiences, and to share them.